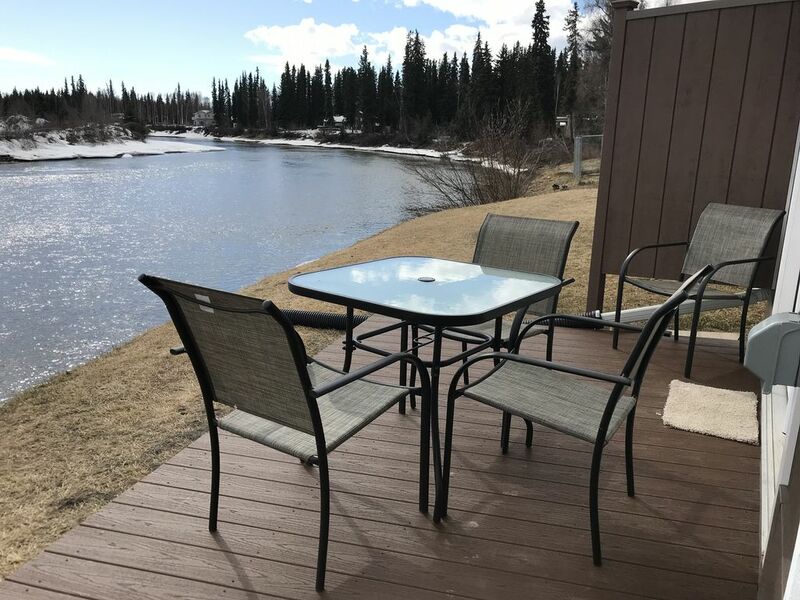 Sit back and relax on this beautifully remodeled one bedroom unit just a few feet from the banks of the scenic Chena river. Whether sitting outside on your private deck enjoying the view of the river or getting comfortable in the well-appointed living room watching a movie on the large flat screen you will find the house the perfect place to settle in and unwind. When you arrive, there will be cold bottled water and fresh fruit waiting for you along with a Keurig and pods for coffee. We also stock other snacks and food like pasta, soup and breakfast items. The kitchen is fully stocked with full selection of large and small appliances along with all of the cook and bakeware you will need to prepare delicious meals. The unit is located in a multi-unit building. This unit is a one bedroom that is completely separated and has a separate entrance. The house has been remodeled top to bottom including LED lighting and tile and carpeted floors throughout the home. There is a smart flat screen TV's in the living room and bedroom with full HD digital cable along with high speed Wi-Fi. There is a washer dryer in the house for your use stocked with laundry detergent and fabric softener and sheets. The bedroom has a quality mattress and bedding and a mounted flat screen TV to relax in at the end of the day. The couch in the living room folds out to a comfortable gel full bed complete with a mattress topper. If you are travelling with little ones we also have pack and play cribs, high chairs and books & toys available. Enjoy this property outdoors by using your private deck, lounge chairs, and lawn area. A propane grill is also available. From October through April there is a one car heated garage available for your vehicle to keep it out of the Alaskan elements. The house is located in the westside of Fairbanks and is close to downtown, grocery stores, University of Alaska Muesum and other local attractions. Chena Hot Springs is about 1 hour away and Denali National Park is about 2 hours away. The bus line and bike paths are just a couple of blocks away. Making sure you have a completely enjoyable stay is our highest priority. Really enjoyed the stay. Place is warm, fully stocked, and appliances work very well. We also appreciated garage being connected to the house which makes it easy to bring bags and luggages in and out. The view of the Chena river is very beautiful. We also saw aurora on one of the nights we stayed here. The owner David is super responsive (even at 4 am PST in the morning he responds back in 10 min) which makes it very easy for communication. Thanks David for making our stay so pleasant! Looking forward to returning, perfect for overnight or weekend for a few people to stay at and explore Fairbanks. Easy to get to, it was neat to be on the water. Owner was kind, easy to reach. Bed was comfortable, Dad says the couch was comfortable. Shower was nice and warm. Will do business again. Reminded me of my days in Vermont!! The place was like BRAND NEW tastefully decorated, HOST was outstanding!! Offered many choices to us to make our stay even better..
And the availablity of a heated garage just topped our stay off!! Nice warm vehicle every morning!! I’ll stay here again and will highly recommend it others. Beautiful place! Perfect for family of three! David did a great job hosting us. The fruit waiting for us was so very appreciated! We were super comfortable the entire time. Perfect place for us. Everything was as advertised. Will go back again and again when we visit FB. Property was in excellent condition. No issues at all.